I’ve been working with the talented Marie Wagner from Mousemade Design to bring more amazing resources for Access All Areas members to enjoy. Marie has kindly donated her popular “The Vintagizer” kit for members to download. It’s a collection of 23 high resolution texture overlays that transform your images from a normal picture to an old film look in just 1 second! Marie discovered these resources back when she worked in post production in the film industry, so these are authentic handmade textures! Marie’s Creative Market store is full of handmade design resources that help enhance your designs with cool effects. If you like the look of this Vintagizer kit, be sure to check out her similar Waterizer item which replicates beautiful watercolour effects. Marie has also hinted at some of her upcoming products, which include items named Chalkizer, Inkizer and Framerizer, which all sound extremely cool! Stay tuned for updates on the release of those goodies by following her profile! 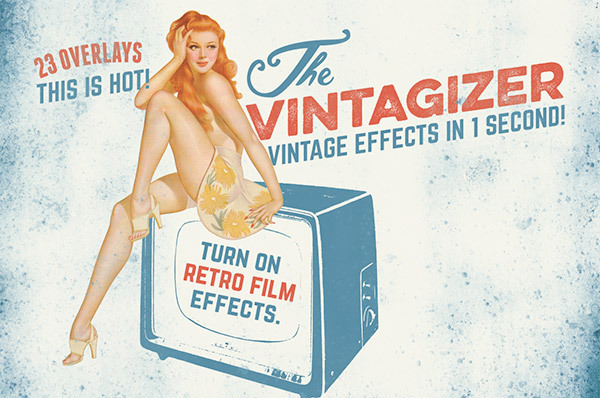 The Vintagizer is a collection of extra high resolution texture overlays made from authentic film and other materials, complete with PNG alpha transparency. They’re ready for simply pasting into your documents and changing the Photoshop blending mode to instantly add cool distressed effects to your artwork. Choose from 23 texture images, including four variants of concrete overlays; multiple film smudges & scratches; and other materials such as leather, rust and wood. It’s fine :) thanks for the comment Chinmay! Nicely it looks really great. These are great. I am doing a photo project for a friend right now with old Detroit buildings in black and white and these textures could really make them pop! Cheers! HI, I can’t seem to download these. It just sends me to One Drive and says this file does not exist anymore. Any ideas? It looks like this OneDrive experiment didn’t work too well – I’ve updated the button with a new link. Can’t get to the files. Can’t get these. Just takes me to One Drive application page. It should be fixed now George, give it another try! I do request that this picture Creating a Debt? Oh, yes! These are really neat! Thank you, sir! Thanks for your help Chris. Chris, these are awesome! Thank you. I’m delighted you think so, thanks! Like being in a candy store! This is so great!